Health Fair July 14 & 15 in Kings Beach! Preventive Health Screenings for Really Cheap! Get thousand’s of dollars of preventive health screenings, not normally performed during a routine office visit, at a fraction of a hospital’s cost! Lose 10 to 15 lbs. the first week! Have more energy! Increase your metabolism! Decrease your appetite! *To start the weight loss program. All of the lab work! New law was implemented to include carbon monoxide detector compliance to go along with the smoke detectors, in all dwellings intended for human occupancy. Deadline to comply for single-family homes is July 1., 2011! Landlords, you are not exempt! Conforming loan limits for high cost areas change again! Regular areas still remain at $417,000. What does that mean for you? When you go to get a loan, you can get a conventional interest rates, and conventional underwriting on loan amounts that do not exceed the conforming loan limits. Anything above the limits, you can expect higher interest rates, and more demanding underwriting. Temporary Loan Limits for the Conforming Jumbo loans is changing as of September 1st. Most lenders will begin implementing August 1st. Loans above these amounts in the specific county will be considered Jumbo loans! Active Listings: The active inventory for residential and lot listings went up 4% to 2,007 active listings in the market; 1,448 residential properties and 559 lots and land listed for sale. Inventory as expected has grown weekly since early May as Sellers are putting homes on the market for the summer and fall selling season. 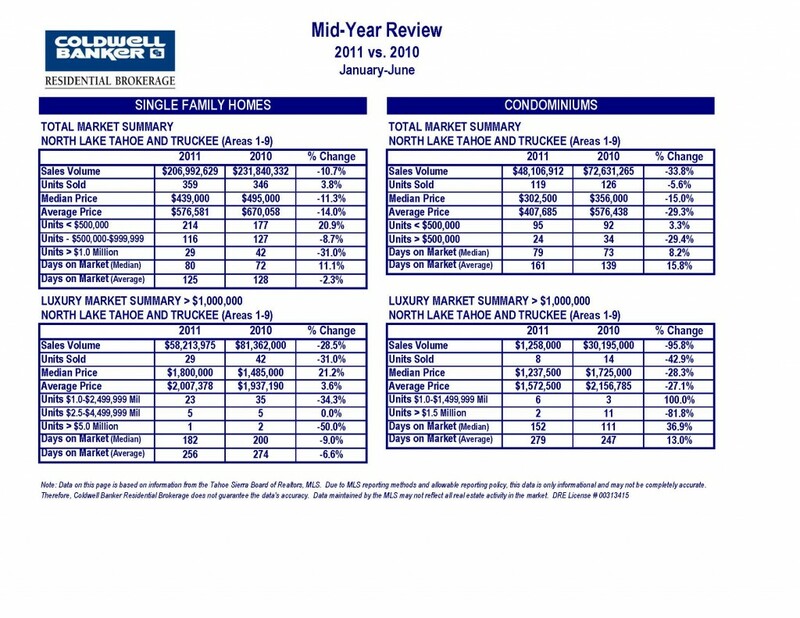 Coldwell Banker has roughly 15% of the active listings in the market and is the market leader for listings. REO-Short Sale Listings: Of the active listings, there are 167 properties listed as short sales, (8.3%) and 44 properties listed as REO sales, (2.2%). Sales: For 2011, there have been 615 properties sold in the market as compared to 643 for the same period in 2010 which is only a (4.4%) decrease in sales. REO & Short Sales: Of the properties sold, 136 have been REO’s, (22.1%), and 87 have been Short Sales, (14.1%) which results in roughly 36% of the properties sold being a distressed property. In 2010 for the same period, there were 138 REO sales and 91 short sales or roughly 35% of the total sales. Price Range: For the year, there have been 433 properties sold priced below $500,000, 143 properties sold between $500,000 and $1,000,000 and 39 properties sold over $1,000,000. Median and Average Sales Prices: The median sales price for properties sold year to date is $365,000 while the average sales price is $463,319. For the same period in 2010, the median sales price was $390,000 and the average sales price was $537,963 which is an (6.4%) and (13.9%) decline in price respectively year over year. Last Week’s Sales: For the week of June 27th a total of 40 properties sold which up significantly from the previous week’s sales of 20 properties. Of the properties sold last week, four (4) of the properties sold were priced over $750,000. Pending Sales: Currently there are 181 pending sales in the market which is up slightly from the previous week. Of the pending sales, 18 are short sales and 26 are REO properties. Wow! The last week of June was fantastic in terms of sales as we experienced the single largest week of sales this year with 40 properties closing. The July 4th weekend was busy with visitors enjoying the multitude of festivities in the Tahoe and Truckee area with many visitors interested in our properties listed for sale. 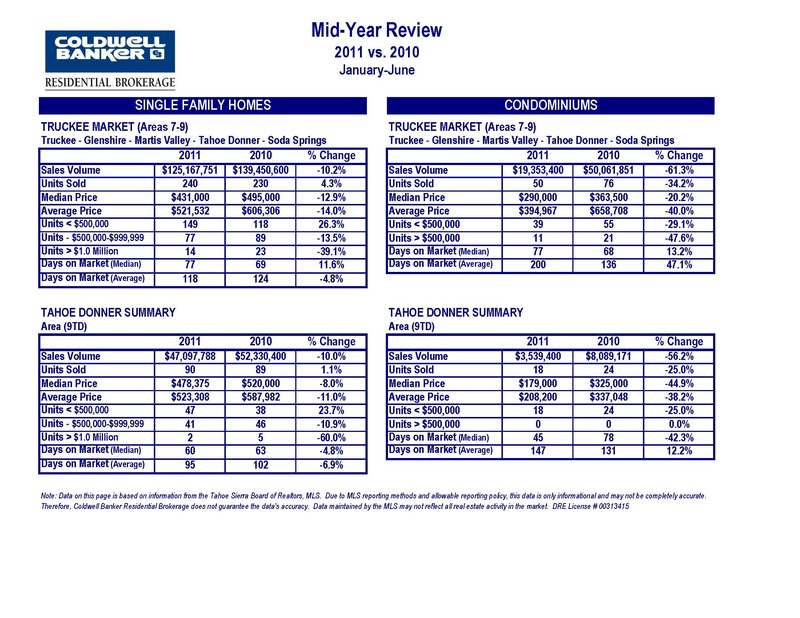 Overall sales year to date as compared to last year are down only 4.4% from 643 sales in 2010 to 615 sales in 2011. More and more homes are coming on the market which if priced competitively could further stimulate sales for a strong third quarter. The hottest segment of the market continues to be homes priced under $500,000 as roughly 70% or 433 properties have sold in this price range. Luxury home sales, homes priced above $1,000,000, continue lag behind 2010 sales as 39 properties have sold year to date as compared to 59 properties last year which is a 34% drop. 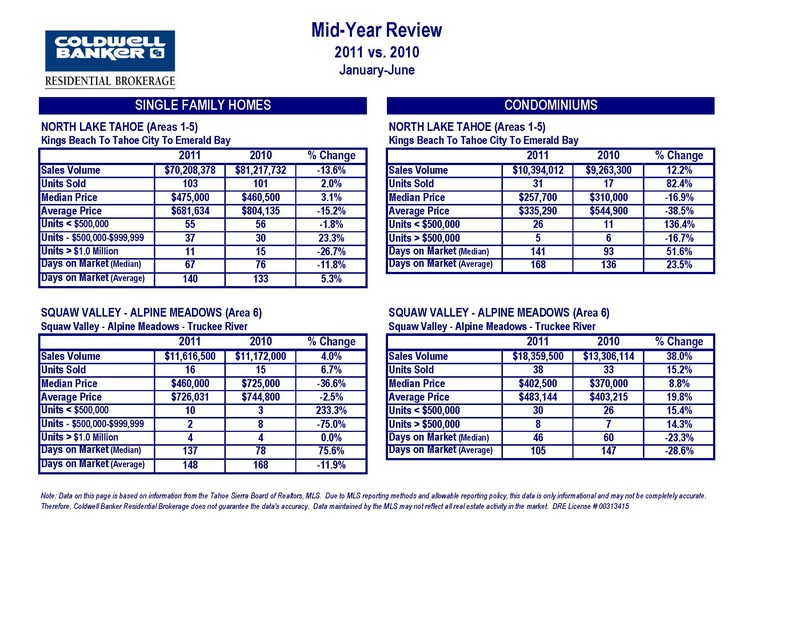 The mid range market, sales $500,000 to $1,000,000 are down as well from last year with 143 properties sold or 23% as compared to 164 properties sold in 2010. Distressed properties, REO and Short Sales represent 36% of the sales in the market which is almost identical to the quantity of REO and Short sales in 2010. Interestingly enough while 36% of the sales are distressed properties only 10% of the active listings are distressed properties. Median sales prices have decreased by 6.4% to $365,000 while the average sales prices have decreased by 13.9% to $463,319. Now may be one of the best times for considering an investment in a vacation home or investment property especially with existing inventory levels on the rise, median and average sales prices trending down and favorable interest rates available to qualified Buyers.